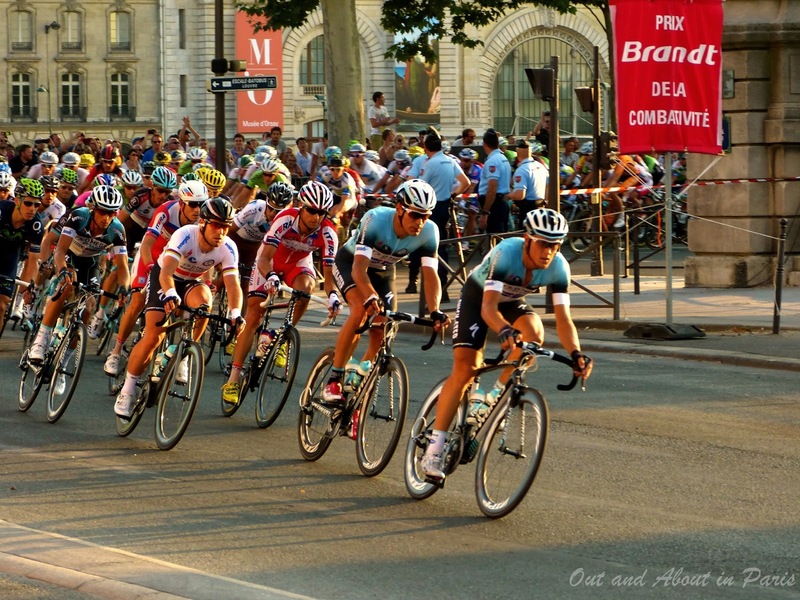 The Thrill of Attending the Tour de France in Paris According to "A Tour of the Heart"
I lived in Paris eleven years without ever attending the Tour de France. It wasn’t until I moved back to the United States and grew a whole new me that I discovered the joy of cycling and the thrill of attending the Tour de France, the greatest bike race in the world. This grueling, three-week-long extravaganza weaves around France–and dips into at least one neighboring country–with all the color and might of the TGV blazing to Lyon on a bright summer’s day. 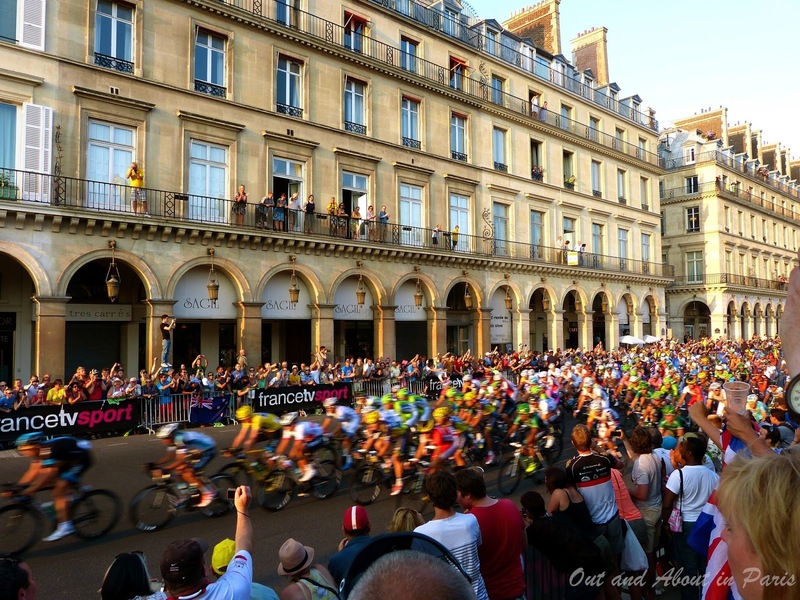 One of the world’s best-loved sporting events, the Tour always ends in Paris, punctuated by the riders doing laps on the Champs-Elysées in front of throngs of cheering crowds. 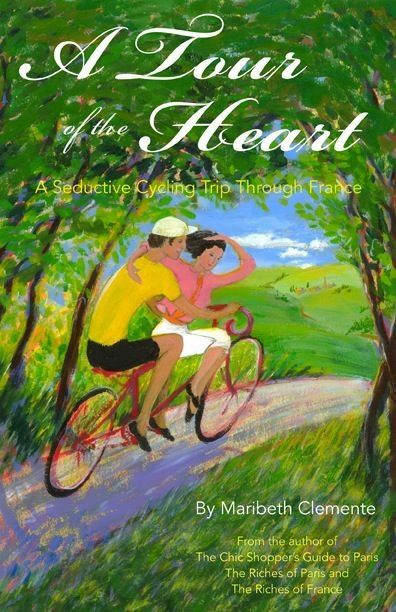 The following is an excerpt from my fifth book on France, A Tour of the Heart: A Seductive Cycling Trip Through France. Part memoir, part love story, A Tour of the Heart is a romantic ode to the most visited country in the world. It highlights the life of a travel writer, France, cycling, food and wine, the Tour de France and the joys and travails of traveling à deux. Pete and I made our way to the middle section of the grandstand in front of the Champs-Elysées, ideally situated beneath the shade of an enormous chestnut tree, directly across from the big screen TV. We were ecstatic. We joked about pinching ourselves since we still couldn’t quite fathom we were really there, ready to watch the final stage of the Tour de France together on the Champs-Elysées. We were in a great place to people watch too, which we did enthusiastically as we observed the diverse range of spectators filling the stands. “Some of the friends and family of a few of the Dutch cyclists sat down behind us,” Pete whispered. Indeed, people from all over Europe and beyond claimed seats around us. “I can’t believe it either,” Pete said shaking his head. “Oh well, I’m making up for it now, aren’t I? It’s nice we can share this big first- time event together,” I said as I gave him a squeeze. “You just stick with me,” I teased. “It seems as though I’ve come to know my way around the Tour scene pretty well.” Just then we spotted a woman descending the aisle distributing ice-cold Cokes. “It looks as though they’re free,” Pete said. “Yeah, and that other person is passing out sandwiches,” I replied. Our luck was doubling by the moment. The 2014 Tour de France cyclists shortly after they entered the city of Paris. Halfway through our most welcome yet unexpected picnic, the giant TV screen was turned on revealing the race in full Technicolor splendor. The Tour riders were approaching the capital. I could sense the excitement mounting all around me with each kilometer that brought them closer to the Champs. The publicity caravan blasted in with all the hoopla of a fast-moving circus coming to town. The fanfare surrounding this colorful cavalcade of promotional vehicles provided an excellent distraction as we sat on the edge of our seats in anticipation of the cyclists’ arrival. If the pretty girls that touted the sponsors’ products were tired out from three weeks of being on display, they didn’t show it. Each was fresh and smiling, waving from the many vehicles like beauty queens at a pageant. They knew what it meant to parade up and down the Champs-Elysées. “Look, that colossal shopping cart with the giant cup of steaming café au lait even made it to the end,” I said. “This is a triumphant finish of sorts for them, too,” I laughed. “Belgium, too. Remember they also rode through Belgium,” I added in a know- it-all kind of way. As the caravan continued to do laps up and down this grand avenue, our attention quickly shifted to the Jumbotron across from us. 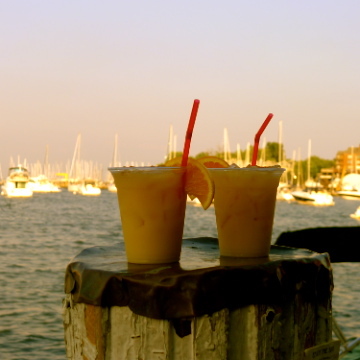 “There they are,” Pete shouted. And when I looked up I saw that the cameras had captured the riders cruising alongside the Seine with the Eiffel Tower perfectly positioned in the background. “The whole scene practically gives me goose bumps,” I said. Not long after the publicity caravan dispersed, a whole squadron of motorcycles buzzed by in front of us. Pete and I–and apparently the rest of the spectators– knew that this pack of motos indicated the eminent arrival of the cyclists. We all craned our necks toward the place de la Concorde as we followed the action out of the corner of our eyes on the Jumbotron. As everyone jumped to their feet and began to cheer wildly, the peloton zoomed into view and barreled up the Champs-Elysées with the force of a fierce wind. After the initial big swoosh, I realized the cyclists were traveling as fast–probably about 25-30 mph–as the motorcyclists that rode ahead of them. It was a glorious sight. And as fast as it all happened, I could see the U.S. Postal team lead the rest of the Tour riders into Paris, as is the tradition for the winning team. 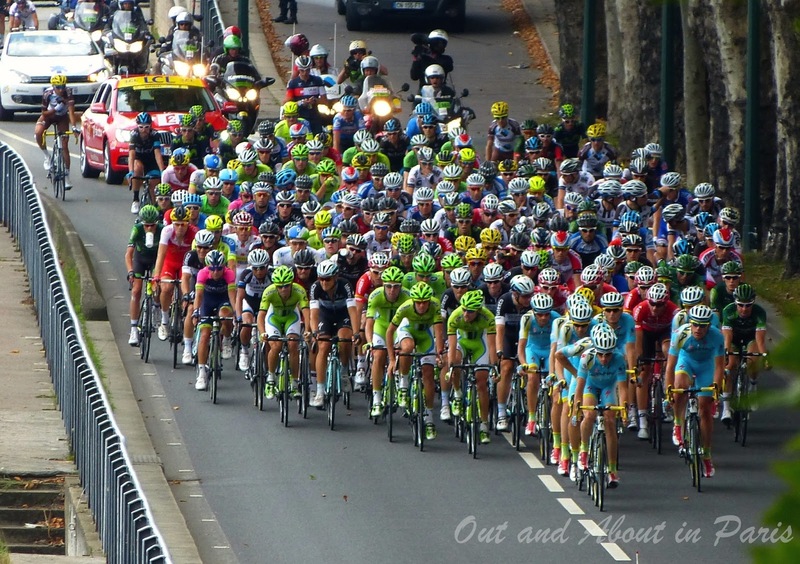 The 2013 Tour de France cyclists whizzing along the rue de Rivoli. It was great to be across from the big screen TV as the cyclists made their way up and down the Champs-Elysées and back down by the place de la Concorde, along the Seine, through the tunnel, and up part of the rue de Rivoli, we could follow every bit of the excitement. “This is the best,” Pete said. “The riders don’t just blow by once. Here–along this loop–they pass ten times. “Yeah, it’s really impressive. Each time the peloton whizzes by, you feel a big rush. I’m over the moon,” I said to Pete. I had viewed the workings of the peloton–a group of approximately 150 cyclists–in action before on TV, but being here in person provided a whole different experience. You could feel the thrust of their combined efforts as the riders pushed the air before them. Everything I had learned about the power behind the peloton was playing out before my eyes. All the principles of drafting were revealed to me in full force. I could see how the riders could race faster for an extended amount of time when they were part of one big, powerful train. Lone riders were at an obvious disadvantage; they had no one to break the wind for them, no one in front of them to create a good draft. 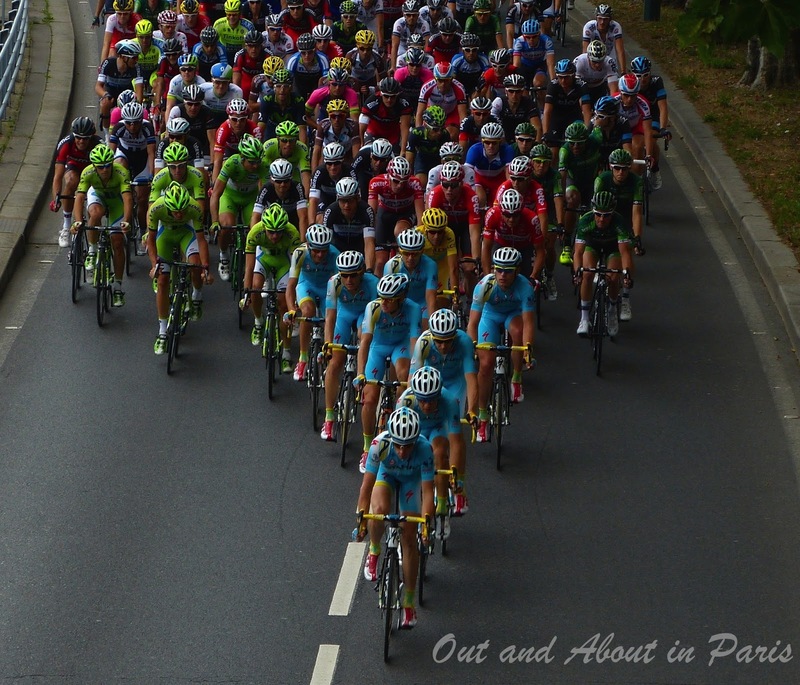 Like a colorful swarm of bees buzzing by, the peloton fascinated me both by its sight and sound. The sound of grace in motion I thought to myself as I watched and listened as I felt another swoosh pass before me. Even I could tell that the pitch on this sprawling avenue only enhanced the beauty of the workings of this massive assemblage of athletes. The conditions were ideal for all the cyclists to work together. “Whoa! There goes someone,” I yelled as I spotted a cyclist break away from the main field on the giant TV. Tour de France 2013 circling the Tuleries Garden. “Oh, you wait and see,” Pete said. “They’re all vying for their moment of glory on the Champs-Elysées.” And sure enough, true to Pete’s prediction, one daring cyclist after another pedaled forth with all his strength in an attempt to separate himself from the mighty peloton. Little groups of intermittent breakaways formed throughout the course. But it seemed as though big gaps turned small again, until finally even those daring souls were gobbled up by the mass of cyclists moving ever faster. Surely it was a challenge for even the best riders to do much work on their own after so many miles and days of racing. 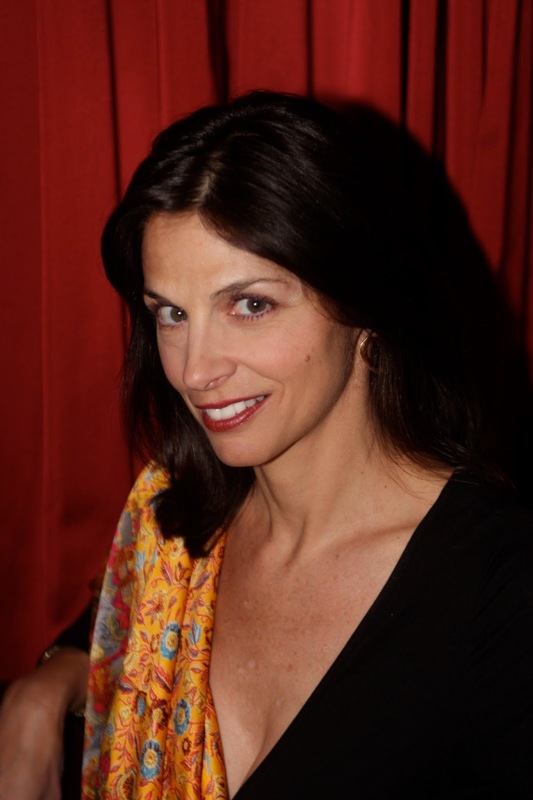 MARIBETH CLEMENTE is the author of The Chic Shopper's Guide to Paris, The Riches of Paris: A Shopping and Touring Guide, The Riches of France: A Shopping and Touring Guide to the French Provinces and A Tour of the Heart: A Seductive Cycling Trip Through France. She now lives in Colorado where she writes about her highly contrasted life at her blog, Bonjour Colorado, hosts Travel Fun, a talk radio show on KOTO and writes for various travel publications and websites. Connect with Maribeth on Facebook, Twitter and Instagram. 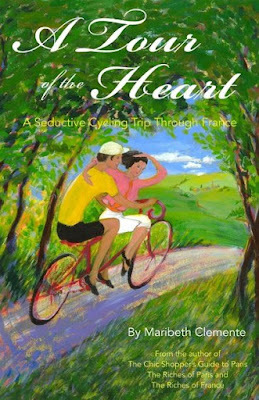 Don't miss the giveaway of A Tour of the Heart: A Seductive Cycling Trip Through France on Out and About's Facebook page on Thursday, July 2, 2015! 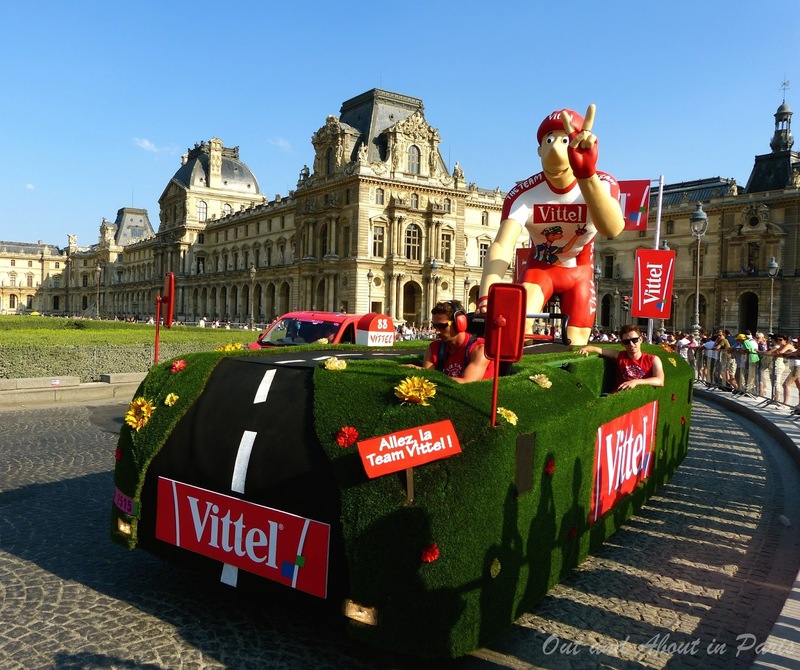 The Vittel float, part of the 2013 Tour de France caravan.